Takasho Reform Garden Club is one of the largest professional networks of garden in Japan. Why don't you do gardening with us? Let's "learn, create and grow up together" in Reform Garden Club! 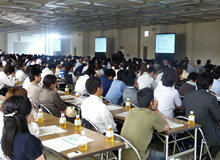 "Takasho Reform Garden Club" is one of the largest professional networks of garden in Japan. Reform Garden Club is a club providing not only products but also solution services. To create a value at "every single garden" to please our customers, every single company performs a key role and proactively engages in activities. The number of members is over 670 companies as of July in 2010, and companies from different industries join the club. 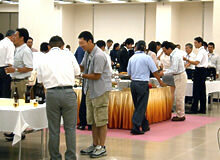 Network and information exchange between the members are active. The members are working hard together as a professional team to provide solution for problems of customer's garden. "Takasho Reform Garden Club" will feature the theme of life in garden and contribute to improvement of community life and life of customers. The workshop held through the nation is not just a manufacture's training program for products, and we work on variety subjects in the workshop. 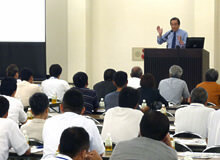 We also think first of interaction and information exchange between the members through the workshop. Reform Garden Club is working on modernizing the industry and stimulating demand with the aim of producing creative-type garden where a value is created and establishing a network of the members. By advertising in wide range of magazines from gardening magazines such as "Exterior & Garden", "MyGARDEN" and "BISES" to architectural or renovating magazines, we seek to increase recognition of the Reform Garden Club. 3. We are glad to help our members. We create each special promotion tool such as a dedicated sign and support our members' sales. Now is the time to prize our "heart". Now is the time to prize our "heart". Reform Garden Club is a gardening professional team which can provide a life of comfortable living garden to meet each customer's needs with the motto "from product service to solution service." Copyright © 2005-2019 Takasho Co.,Ltd. All rights reserved.